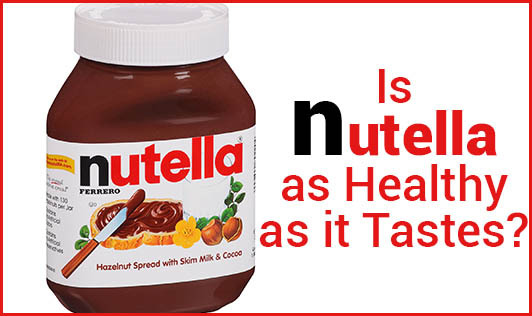 Is Nutella as Healthy as it Tastes? A favorite for all the chocoholics is Ferrero Company's Nutella; founded in a backroom of the pastry shop, in Alba in 1944 by Pietro Ferrero. Nutella, a spread on bread, has become an essential element to the breakfast in most of the countries worldwide. The rich and creamy Nutella can be widely used not only as bread spread but also with a banana smear and many other mouth-watering recipes. The main ingredients of Nutella are sugar and vegetable oils (mostly palm oil), followed by hazelnut, cocoa solids, and skimmed milk. The claim is right... Nutella is a great source of energy. But, in a 19g serving of Nutella, 11g is sugar. Once the insulin spikes, the sugar gets burnt and will make your kid lethargic after an hour or so. Hazelnuts comprise only 13% of the ingredients. With this low percentage of hazelnut, you cannot expect Nutella to be a good source of essential fat, vitamins and antioxidants as the company claims! Hazelnut does have good amount of Vitamin E but no other vitamins like B, C, and D. Skimmed milk or the milk solids also make up less than 7% of the ingredients, which is again not meeting the daily requirements of your child. After sugar, the second most common ingredient in Nutella is vegetable oils; mostly palm oils. Palm oils are known to be high in saturated fats, thus increasing the risk of cardiovascular diseases if taken in high amounts. According to Italian law, Nutella cannot be considered as a chocolate cream, as it does not meet minimum cocoa solids concentration criteria. Soy lecithin, used as an emulsifier and hazelnuts can also trigger food allergies in a few kids.